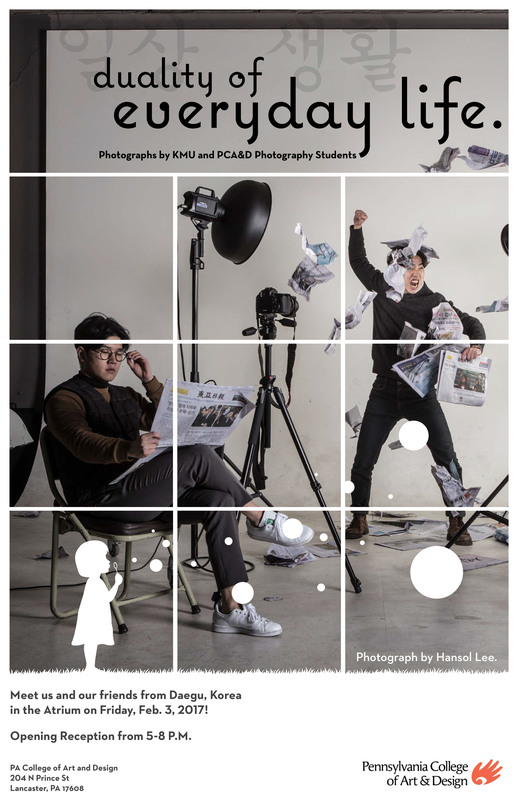 Ten Korean photography students, led by Hoon Jung, Professor of Photography and Related Media, from the Art and Media at College of Fine Art at Keimyung University, Daegu, South Korea, are visiting Pennsylvania College of Art & Design this week. 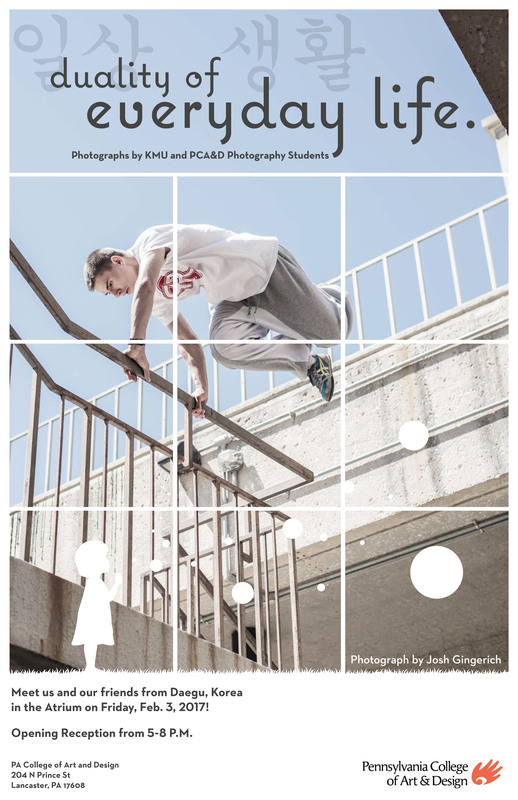 Together with PCA&D's photography department they will participate in group critiques and collaborative discussion, culminating in a photography exhibition "Duality of Everyday Life" in the Atrium on Friday, February 3, 2017, featuring the work of students from both programs. The Opening Reception will be held from 5-8 P.M. 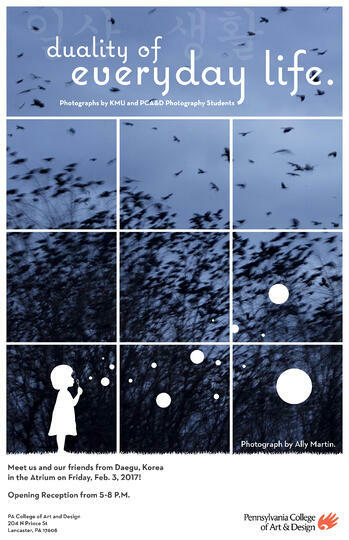 Posters for the exhibition, pictured below, feature photography by Honsol Lee, KMU, Josh Gingerich, PCA&D, Ally Martin, PCA&D and Yoingsu Lee, KMU. Phoster design by Josh Gingerich. The KMU students and their professor are visiting PCA&D as part of their scholastic trip to New York City, Washington, DC, and San Francisco. Eric Weeks, chair of PCA&D's Photography Department visitied KMU during May 2015 to present an artist talk. This is the second partnership that PCA&D has with a Korean University. 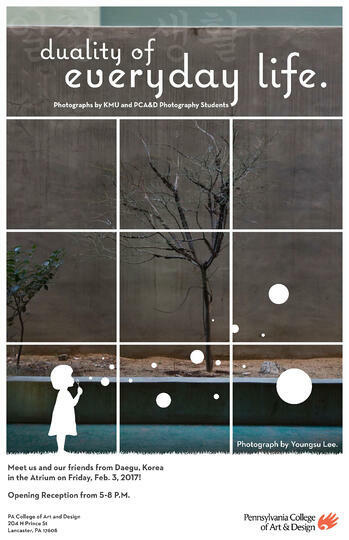 Students from PCA&D and Kyungil University, Daegu, South Korea, maintain a photography exchange blog around themes posted by faculty members from the schools.